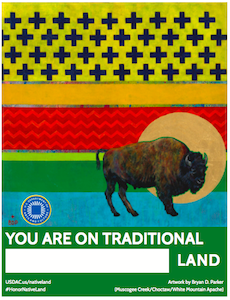 In early October, the USDAC released Honor Native Land: A Guide And Call To Acknowledgment, a free, downloadable Guide created in partnership with Native allies and organizations. It offers context about the practice of opening events by acknowledging the traditional inhabitants of the place, gives step-by-step instructions for how to begin wherever you are, and provides tips for moving beyond acknowledgment into action. If you haven’t already downloaded your Guide, visit the web page to access it along with customizable posters acknowledging Indigenous lands, and a short video featuring Native artists and activists. Acknowledgment by itself is a small gesture. It becomes meaningful when coupled with authentic relationship and informed action, as an opening to greater public consciousness of Native sovereignty and cultural rights, a step toward equitable relationship and reconciliation. On October 17, the #HonorNativeLand campaign was featured on Native America Calling, broadcasting on over 70 public, community, and tribal radio stations in the United States and in Canada. Listen to the recording featuring USDAC Chief Instigator Adam Horowitz, Mary Bordeaux (Sicangu Lakota) of Racing Magpie, the artist Bunky Echo-Hawk (Pawnee/Yakama), Ty Defoe (Ojibwe/Oneida) and Larissa FastHorse (Sicangu Nation Lakota) of Indigenous Directions to learn more about the practice of acknowledgment and what it means. Hau Mitakuyapi. Nape Cuzayapi. Cante Waste. I greet each one of you as a relative, with a handshake, and an open heart and mind. As a Lakota person who is a guest in this place, I’d like to recognize the land belonging to the original people. This place is known to the Tewa-speaking people in their language as Kua'p'o-oge, “the white shell water place.” Here, a sacred hot spring existed, a Pueblo holy site, that Spanish settlers destroyed to erect the Cathedral Basilica of St. Francis of Assisi. But Pueblo people remember this is their land and so must we. Signers include a range of local and national nonprofits, arts organizations, and education institutions, such as: the New Economy Coalition, Women of Color in the Arts, Arts in a Changing America, ArtWell, Barefoot Artists, Emerging Arts Leaders/Los Angeles, Arts in a Changing America, The Field, Native Arts and Cultures Foundation, U.S. Federation of Worker Cooperatives, The Natural History Museum, Peñasco Theatre Collective, and Alverno College International & Intercultural Center. Imagine cultural venues, classrooms, conference settings, places of worship, sports stadiums, and town halls acknowledging traditional lands. Millions would be exposed—many for the first time—to the names of the traditional Indigenous inhabitants of the place they stand, inspiring them to ongoing awareness and action. Join us in sparking this movement by urging organizations you take part in to take the pledge now! The Santa Fe Art Institute is new to this process, which I see as ongoing. We began the practice of acknowledgment after a couple of our Indigenous Canadian artists in residence approached me, asking why we were not acknowledging traditional territories at public events. They said the practice was now considered protocol at all Canadian events, but it was an entirely new concept to me at the time. I realized that—although my work prior to SFAI was primarily focused on affordable housing and cultural sustainability with Native American communities—I had always respectfully relied on my Indigenous friends and colleagues to set the tone and carry out acknowledgments. As this was all being discussed during the wintry protests at Standing Rock, with all of the world bearing witness to the courageous water protectors, it felt urgent to take on, both from a personal and institutional perspective. Although we are seeking more guidance to make sure that our acknowledgment is appropriate, we are kept on track with this process by people who have approached me to say that SFAI doing this is affirming for and important to them. This kind of feedback has helped me to realize we need to make it more of an institutional imperative. I feel it sets a beautiful tone of reconciliation that we all need. I am in such gratitude for the patience and kindness shown by my Indigenous friends and colleagues as this practice unfolds for SFAI, and as we make mistakes as we step into it. I ask for ongoing assistance, feedback, and collaboration to ensure it is a meaningful practice moving forward. I am particularly tied into the Asian American arts communities in the Bay Area. I announced the acknowledgment project and mentioned the Coast Miwok Native people at the opening of “Hungry Ghost” (see A Place of Her Own), an exhibit that recently opened at Gallery Route One in Pt. Reyes, California. Much of what I curate has to do with helping artists heal by creating thought-provoking shows that provide a platform to share stories of ancestral, familial, gender, and cultural trauma. This includes historical references to colonization, forced migration, discrimination, violence, and the effects on long-term family patterns of trauma. I do this to help women artists and the community heal, increase consciousness around their own dysfunctional patterns and releasing them to move towards new ways of thinking; and to wake up the communities that surround us, to instill compassion, grow passion around various issues and civic engagement and a call to action. The “Hungry Ghost” art exhibition brings up all these issues for the artists. If we are going to bring up colonization, I thought, how could we not address the deepest colonization of Indigenous land, closest to home? I always ensure we practice gratitude verbally and with print signage for each show, expressing thanks for our venue host, sponsors, donors, volunteers, artists, etc. I am excited to add #HonorNativeLand. A couple years ago, I helped organize The Kansas People's History Project which aims to shine a light on lesser known stories about people and events from the state's past. When I went around Kansas giving presentations about how folks could get involved, I always started with a slide of a map of the state. I said that the project was straightforward: just choose a person or event from Kansas that you feel needs more attention, write a brief narrative and illustrate it however you like. Wait, I said, I need to clarify, because of course Kansas wasn't always Kansas. Before it became a state, it was part of the Kansas Territory. So, to be more accurate we'll call this The Kansas and Kansas Territory People's History Project. Except, before Kansas was the Kansas Territory, it was part of Louisiana, so to be more inclusive we'll use the title, The Kansas, Kansas Territory and Louisiana People's History Project. Whew. But before Kansas was Louisiana it was (and still is) the home of the Shawnee, Ioway, Wyandot, Potawatomi, Kansa, Sac and Fox, Wichita, Osage, Delaware and many other Indigenous peoples. In other words, when you think about it, this shouldn't be called The Kansas People's History Project. It should be called The Shawnee, Ioway, Wyandot, Potawatomi, Kansa, Osage, Sac and Fox, Wichita, Delaware, Kansas, Kansas Territory and Louisiana People's History Project. Acknowledgment of ancestral lands is a small step, yes. But the truth has a way of expanding to fill the available space. If you aren’t already living into the truth embedded in the land you’re standing on, join us in taking the first steps by downloading the Guide, using the posters, and taking the pledge. You can find them all here.